i had a reflexiology massage done to my sore feet the other day where i actually didn't enjoy the treatment at all. it hurt and felt uncomfortable when the messeuse pinched the area between my toes. she told me if the point where she pinched hurt that meant i have a problem corresponded to that point. the chinese believe in accupuncture, accupressure and reflexiology. they believe in everything based on the yin and the yang. in this case, when you have problems with your ears or eyes, there are specific points on the other parts of the body that have to be pinched or pressed or stuck by a needle to heal those problems. but still, i prefer a body massage to unwind my muscle than doing a reflexiology treatment to heal whatever problems i have corresponding to the points in my feet. the interesting part was when i visited a spa in bali. 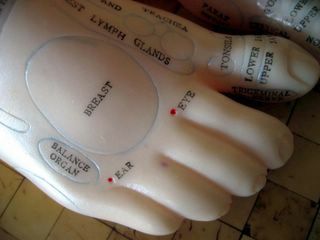 there i saw this foot chart of reflexiology where i noticed a kind of a big circle in the middle of the chart tools written 'breast'. what makes me curious is when you press that circled area. then what will happen to your breast(s)? sok aja coba sendiri man..hehehe. gue dulu waktu SMA rajin jalanin reflexiology..tapi memang treatment yang bener2 gitu..bukan sekedar untuk rileks aja kaya yang di salon2 sekarang..dan memang bener tuh kalo ada yang sakit pas di pijet tuh sakiiiiiiitt banget sampe nangis2..tapi emang enak banget, kayanya langsung kena ke penyakitnya gitu. di conrad gue paling suka spa-nya deh. keren bgt. kalo kamarnya biasa aja sih.